Location: Texarkana , Texas, USA. After hosting previous conferences in Dallas and Austin, for this conference we selected the smaller city of Texarkana which sits on the junction of Texas and Arkansas near the border of Louisiana. We chose this location to make the conference more accessible for judges who have not had a nearby conference recently while still maintaining proximity to both DFW and Oklahoma City. On our site visit to select a venue, we considered two convention centers, a library, a community center, and the LGS. 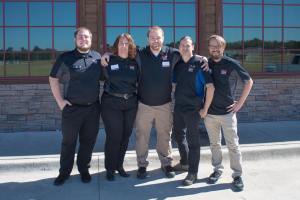 While at the LGS, the store judge suggested the Silver Star Smokehouse for lunch and later when dining at this barbecue establishment, we noted the large private room. Upon investigation, we discovered that its capacity exceeded our needs and that it could be subdivided into 2 smaller spaces as needed. Each side boasted A/V capabilities and ample seating. The restaurant also offered a separate quiet boardroom with a large table and comfortable chairs that would serve well as a testing room. The manager informed us that use of the rooms would be free if our group purchased lunch from the restaurant. We confirmed availability for our date and tentatively booked it on the spot! Sixty-eight judges attended the conference including nine from Arkansas and five from Louisiana. Approximately 20 L2s attended and approximately 45 L1s. David Hibbs (Austin, TX) and John Carter (Renton, WA) were the L3s in attendance. We arranged with the venue an all-you-can eat lunch option with water and sweet tea available all day long. 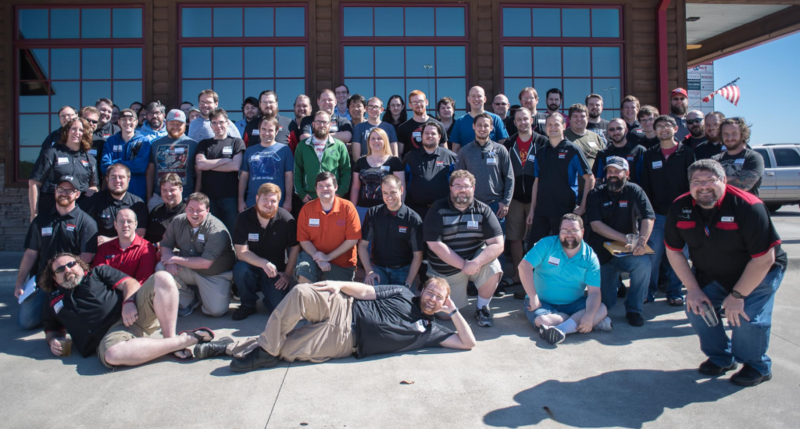 By charging each attendee $15 for a catered lunch, we secured a larger, more efficient space to make the conference more comfortable than previous events in a cramped LGS. It also eliminated the need for a lengthy lunch recess and allowed for more natural conversations during the meal among judges who may not have known one another. Upon arrival, each judge received a personalized packet containing a nametag, feedback forms, a creature token, a door prize ticket, and a pen. The preprinted nametag listed the judge’s name and location which facilitated judges meeting one another. Each packet included four feedback forms that were color-coded for each presentation. The token served to divide judges into small groups for a focus group activity later in the day. The focus group leaders additionally had a huge version of their group’s token to identify their role. Each table featured a selection of candy for munching during the conference and tea and water stations sat in each room. Creating this comfortable environment help participants relax and engage in the event. 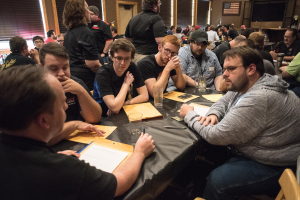 During each breakout session, moderators drew winners for small door prizes such as judge notebooks, playmats, or PAX pins. Adding this fun element livened the mood of each room. We decided on the theme of “Your Identity as a Judge.” It encompassed the regional need to connect with judges on a personal level and build their excitement for the judge program. Our keynote, delivered by David Hibbs, was entitled “The Judge Program: You Are Here.” It focused on the structure of the program and the roles of various groups within it. This information guided judges to understand both their current situation and allowed them to set goals for their future development. We concluded the day by dividing participants into small groups led by senior judges to consider discussion questions about the day’s experiences. These activities intended to facilitate the transfer of information learned at the conference to actual practices for judges. David Carroll led our staff as the Conference Organizer. David oversaw all decisions pertaining to the event and managed the other staff members. Additionally, he acted as the testing coordinator. Erin Leonard handled the conference logistics as well as managing the presenters. David Hibbs provided support, delivered the keynote, and handled some L2 testing. Spin Rodriguez participated in the conference planning, then served handled day-of duties including setup, registration, photographer, L1 room monitor, check-out/foil distribution, and breakdown. Brian Leonard’s tasks included setup, registration, information technology and A/V, L2 room monitor, check-out/foil distribution, and breakdown. We created a schedule intended to maximize time for community building in addition to providing the attendees with presentations of solid value. Following the keynote, we offered a panel called “Ask Me Anything with the Area Captains.” Participants could interact with regional leaders and served to break the ice and get people talking before lunch. A quick group picture followed while the restaurant finished setting up our meal. The afternoon consisted of three breakout sessions targeted for L1s or L2s, and testing took place during this time as well. A staff member moderated each room to introduce the presenters, ensure that we ran on time, and help with technical issues. In the final session, participants broke into small groups to discuss the conference’s content and its impact on their future as judges. Each group’s composition mixed veterans with newer judges and pulled from geographically diverse areas. These groups both introduced new people and helped participants set goals for their own personal development. After the focus groups, attendees exchanged their completed feedback forms for foils at the check-out table. Our keynote, panel, and focus group activities were designed to build community and provide participants a general guide to the judge program. The breakout sessions delved into specifics. In the L1 room, we offered presentations on the judge Code of Conduct, deck checks, and LGS relations. For L2s we scheduled self-care at events, inspiring and motivating a team, and Premiere TO relations. Each room’s selections included locally relevant content and interactive elements. David Hibbs and John Carter tested and promoted five L2 candidates. David Carroll certified a new L1. One judge asked to take an L2P at the event, and David Carroll discussed the results with him. The greatest successes of this conference proved to be the location and the preparation. The new connections forged among judges in our region outweighed the logistical difficulties. The time we invested in creating nametags, packets, and color-coded feedback forms translated into measurable results at the event, evidenced by the smooth check-in and check-out processes. The ability to provide presenters real-time feedback also constituted a bonus. Our hard working staff contributed to our success. The biggest improvement we could make would be in the content of the presentations. We went principally with those who volunteered instead of recruiting presenters for specific topics of interest. Additionally, having both the focus groups and the area captain panel lowered the number of presentations we had time to include, however for the specific location and purpose of this conference, those choices were appropriate. For a more urban conference, selecting only one would work better. While this conference brought some logistical challenges with its remote location and unusual venue, it provided an excellent opportunity to reach out to an underserved part of our region and create lasting connections among judges.